Although Hugo Chavez is fond of portraying himself as a revolutionary in the tradition of Lenin, Mao, Fidel and Che, he has followed a distinctly unique approach on his path for absolute power over Venezuela. The key to that approach has been a limitless patience as well as an ability to charm a wide range of Venezuelans and international citizens. He has managed to convince many that his is a peaceful and democratic revolution, whose main concern is the well-being of the poor in Venezuela and the world. But as the December deadline approaches for the modification of the Venezuelan constitution, Chavez's mundane desires become clearer: to have absolute power for as long as possible. As the constitutional lawyers Alirio Abreu Burelli and Carlos Ayala Corao point out in this article for El Nacional on Sunday, the modifications to the constitution represent an assault on democratic principles. 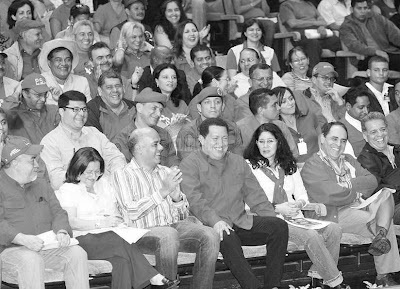 Up until now, Chavez has been able to proceed by masking his dictatorial intentions. However, these constitutional changes being voted on by a puppet National Assembly are a de facto constitutional coup d’état that will centralize power in Chavez's hands and allow him to stay in power indefinitely. Abreu Burelli and Ayala Corao discuss some of the consequences of this impending assault in seven different sections of the constitution. Alirio Abreu Burelli, ex-magistrate for the Inter-American Court of Human Rights, and Carlos Ayala Corao, ex-president of the Inter-American Commission on Human rights, warn about the risks of modifying the Magna Carta so quickly and how it is an attempt to tailor it to the President’s political project. The Supreme Court judges will be able to be freely removed by a simple majority of the National Assembly. Such a change reduces the independence and autonomy of the highest authorities of the Judicial Power, to the degree that they could give in to pressures in order to keep their positions. The postulation committees will be made up of entities of the State and not by organizations from society, which diminishes the guarantees of impartiality for the rectors of Judicial Power and Citizen Power. The National Assembly will not have to approve the Plan for National Development. The autonomy of the Central Bank of Venezuela, the autonomy of monetary policy and the administration of cash; all these will be in the hands of the President of the Republic. The national government council and the State council were presided by the vice president (now it will be by the President). More awareness within Venezuelan society about the importance of the independence and autonomy of public powers for a democracy. More awareness among the international community about the undemocratic nature of the constitutional reform. The “national system of cities” will imply centralization in the Executive Power of the local duties of cities. The nationalization and centralization of the regulations for Caracas and the Federal District. The centralization of communal councils within the national power; their registry, regulation and financing. The centralization of the national government council: its members will include only those governors and mayors “convened” by the President. The President will be able to create military regions and name their authorities. He will be able to create central entities that are above the states and municipalities, such as federal provinces, federal territories, functional districts; and to name their authorities (they will not be elected). The elimination of the Metropolitan District of Caracas and its substitution by a Federal District. The democratic origin of its authorities is not clearly visible. In theory, more constitutional stipends, but not in practice, because now the states and municipalities will have to share not only with the Federal District, but also with the communal councils and the rest of the organs of popular power (and it is not clear if also with the federal provinces, federal territories and functional districts). The right to information and due process could be affected, rights that are fundamental for avoiding abuses of authority. It is not enough to guarantee a few rights of due process, since it is an integral right that cannot be divided. When article 337 of the current Constitution is modified, in order to exclude the right to information as one of the rights that cannot be suspended during states of emergency, the principle of progressiveness is violated, as expressly consecrated in article 19 of the Magna Carta. The parliamentary control for revoking the decree of a state of emergency. The temporal limits of states of emergency as a guarantee. The judicial control that figures in the current Constitution as an unavoidable requisite is not made clear. Specific references to the international limits of states of emergencies (Inter-American Convention on Human Rights and International Covenant of Civil and Political Rights). More awareness about the risks of restrictions on freedom of expression during states of emergency. The explicit constitutional acknowledgment of property as a right. The consecration of the social function of property. The universality of the goods that can be the object of property. The distinction between “goods for use and consumption” and “goods for production acquired legitimately” is an invitation to arbitrariness so that the law can determine what goods are susceptible to property. Moreover, what does goods “acquired legitimately” mean, and who will determine what they are? The goods that are the object of appropriation can be occupied administratively without any previous judicial authorization, which leaves them practically powerless at the hands of the State. The guarantee against the confiscation of land. Environmental offenses will be able to be punished with the confiscation of land; moreover, the types of offenses are not determined. The dismantling of intellectual property, its protection is not fully guaranteed. All of this generates judicial insecurity for all Venezuelans. More awareness about the risks of arbitrary actions against property in the new Constitution. Work as a freedom for human beings. The right of citizens to dedicate themselves to a legal economic activity of their choice. Now, Venezuelans will work under whatever conditions the Government imposes, within the range of State policies. The risks for the autonomy of unions when facing the new workers councils. In practice, the right of workers to associate with one another for the sake of making demands could be evaded by a State-promoted leadership, despite the fact that in many cases the State is the patron. The reduction of the work cycle to 6 daily hours or 36 weekly hours. A social security system that supports independent workers, with the provision of creating a fund nourished with contributions from the State and the worker. Because it is a matter of social justice, it is logical to see an almost general support for the improvement of the working conditions and guarantees for Venezuelan workers. Both matters could have been resolved legally several years ago, according to the specific mandates of the current Constitution. Political pluralism, since the mechanisms of participation (elections, referendums, etc.) will be tied to a single ideology: socialism. The conditions that facilitate popular initiatives (constitutional and constituent reform) and the various referendums. Governance by elected authorities. The President of the Republic will be able to name central authorities to govern without being elected (federal territories, federal provinces, functional municipalities, military and special regions, and others). A popular power that does not surge from the votes of the people. The authorities in charge of popular power will not be elected by their communities through free and secret elections. The gathering of society and the masses under the control of the State: Popular Power ends up being a “power” of the State, and it no longer belongs to citizens who participate from society. More awareness among people about the loss of participatory and democratic spaces in the new Constitution that is about to be approved. An excessive stability for elected officials. The character of an institution that is not at the service of any single person. Its institutional mission within a Constitutional State of Law, beyond any political or party conceptions (Bolivarian Armed Forces). The conception of the Armed Forces as being within “national security” so as to maintain order and defend itself from “internal” enemies. The militarization of a large sector of the population, by means of their incorporation to a new component of the Armed Forces: the national militia. The promotion of a popular war of resistance, instead of a culture of peace. The disregard for recommendations by international organizations about the need for security forces to be of a civilian nature. Increased direct interference from the President in promotions at all levels. Increased direct interference from the head of State in the bodies, components and units of the National Armed Forces. More awareness about the risks of dismantling the institutional nature of the National Armed Forces with the new Constitution. (Editor's note: this is the first comprehensive summary of the new changes, which include the articles added quickly by the National Assembly to the Original proposal of Chavez of "only" 33 articles. That is, the changes now are a whopping 69 amendments to the 1999 constitution. We must admire the efforts of Abreu and Ayala to have tried to be as objective as possible in their discussion of such a flagrant legal coup). This may be a very naive question, but does anyone have an idea why the Venezuelan congress is so eager to dilute their own power and grant decree powers to the president? Are all 167 members under some sort of hidden gun, or gestapo police, that forces them to give up power so easily. I have been reviewing the constitutional reforms, and as crazy and far reaching as the presidential changes are, I think the assembly's proposals go even further. In article after article, they are eager to turn over powers belonging to Venezuelan citizens, and the national assembly. I just dont get it? There is got to be something I'm missing here, since most political actors, even when they have good ideas, are also eager to increase their own powers rather than reduce it? Some one please chime in here?